Did the title of this post get your attention, or did the beautiful Nia Peeples get your attention? No matter, whichever way you get to hear about this new DNA Skincare line brings you closer to having your best, healthiest skin! Of course, as a woman, I’ve spent lots and lots of time thinking about, caring for, protecting and stressing over my skin. 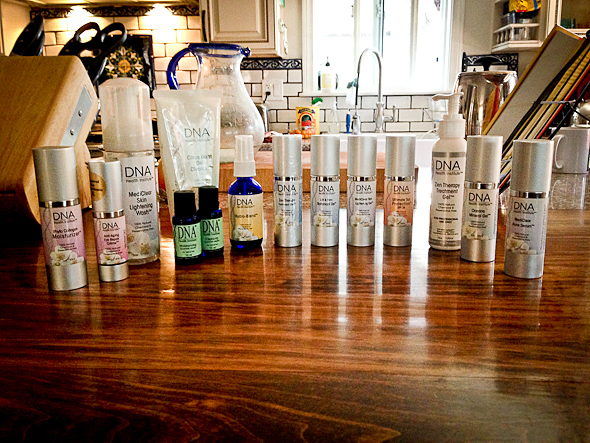 Back in September, while I was visiting Nia down in Malibu, she gave me some of her new skincare line to try. As most women have, I’ve tried a lot of skincare products, but very quickly I realized this skincare line is different. It just “feels” different if that makes sense. After the first use, my skin felt softer and smoother. Yes, that quickly for me, and I know it can be different for every person. It seemed that my skin absorbed whatever it needed from these products to create this smoother and softer feeling. It’s as if I could “feel” my skin taking in exactly what it needed from each product. I asked Nia, what is so fabulous about these products? She told me that with the help of creator Dr. Aguilar, these products are able to treat your skin at a cellular level. They are the only products in the world that use ionic chemistry in their formulation. ( that’s nature’s way of showing us which ingredients work best together.) They’re chemical and preservative free and 100% natural. All the ingredients are organic but the product isn’t certified organic because that certification requires adding 30% alcohol for stabilization! (crazy) Dr. Aguilar refuses to add the alcohol because the ionic chemistry stabilizes it naturally. I’ve now been using the products for almost 2 months and, I simply cannot imagine using anything else. I’m still enjoying how my skin feels and even more how it looks every day, and I still see improvements all the time. Anyone, who knows Nia, knows she has absolutely flawless skin. She’s had access to try all sorts of products and of course, been asked to sponsor many lines. Even with all the access and availability to products she has had, this is the line she has chosen to represent. That alone says a lot to me. If you know Nia, you also know she studies very thoroughly anything she puts her name with – she doesn’t commit herself casually to any products. The excitement and energy I saw her exhibit when sharing these products with me was enough for me to give them a try. There’s another reason to try these products should you need one – a percentage of every dollar spent on these products goes to support Mending Kids International. Mending Kids International is a great organization that helps provide life-changing surgeries for children worldwide. Check out the DNA Skincare site for more information. Oh, and let me know if you do! !